I really enjoy eating a nicely seared piece of pork chop and stuffing them is so much fun. This time I wanted to try stuffing it like I do my green peppers and tomatoes. Using brown rice, sausage and corn as the stuffing and a beautiful cut pork chop a beautiful dish was created. Now. You are probably wondering why an islander like me would be eating pork chops. Well. I enjoy sucking on and chewing the bone from the chop. It has received all of the nicely blend seasoning seared in just waiting to be released. 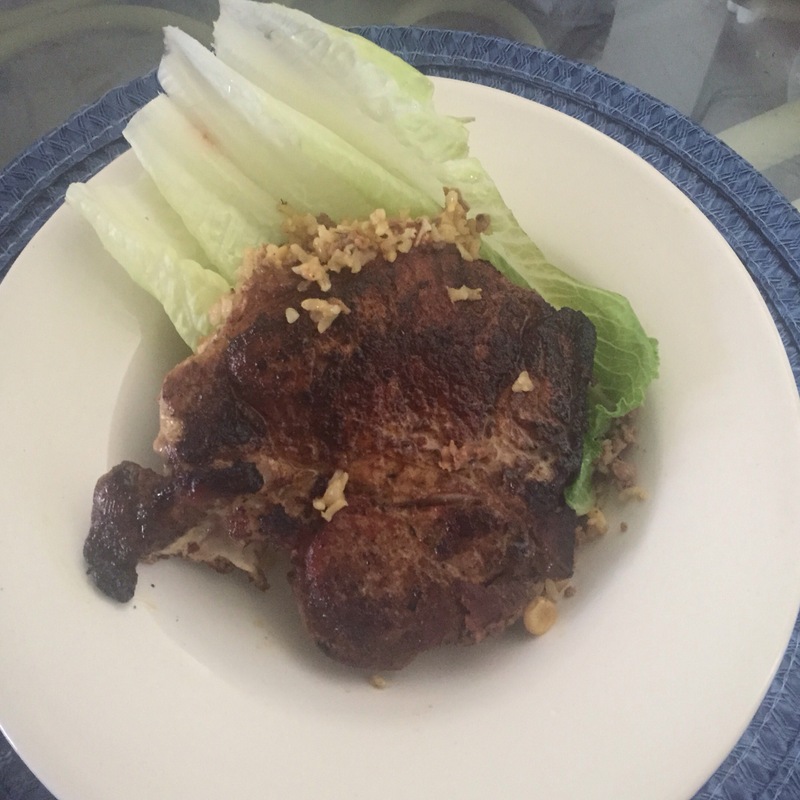 Since I used a grain to stuff the chop, just springs of romaine lettuce drizzled with a bit of olive oil and sea salt completed the dish. The pan frying in low heat then stuffing with the delicious mixture before placing in the oven for ten minutes takes this mouth watering dish over the top if I do saw so myself. 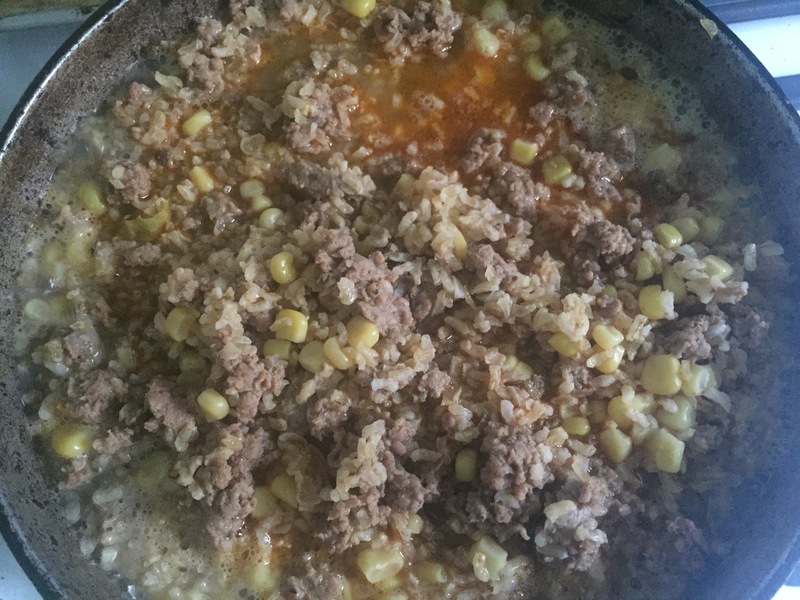 The stuffing mixture itself of sausage, corn and brown rice was so delicious that I ate a bowl of it just by itself. So. Try it and judge for yourself. It’s so easy and so tasty. Enjoy. Bills Burgers will be opening on April 22nd in the Westin Hotel in downtown Pittsburgh. It’s taking over the spot that once housed the Fish Market. At the tasting menu preview it was obvious that this would be an interesting place to eat and enjoy the warm and interesting atmosphere. President and C.E.O. James Gersten said “Pittsburgh has an amazing food scene and we have a great relationship with the hotel so it was easy to decide to open a place here.” Bills Burgers offers more than burgers and fries though those are quite delicious especially the award winning, Fat Cat Burger. Gersten points out the exceptional work by the in-house sushi chefs who make beautiful and tasty work. I tried several of the pieces including Bill’s Pittsburgh Roll that’s made with spicy tuna, eel, avocado, cucumber and eel sauce. It’s worth trying even if you are not a sushi fiend like I am. One of the very unique aspects of Bill’s is the relationship it has developed with many of the local businesses. You’ll find that connection on the menu with items such as the fickle and pickle dish, tart and of course Heniz products. Gersten says Bill’s Burger hopes to attract customers, “from the hotel guest, convention goers and definitely the loyal Pittsburgh customers” and he believes the quality and variety of the items will do the job. Besides the excellent sushi, burgers, shakes and fries are the down right delicious desserts. They are so worth the extra calories. They range from cherry pop tarts to warm and delicious cookies. One thing James Gersten wants Pittsburgers and visitors to know about Bill’s Burger is the local chef and management team commitment to making every visit the very best. I can sing praise to my lovely oven day or night. It’s like my crock pot but bigger so I can stuff more stuff in. Don’t get me wrong, I love the convience that a crock pot provides in putting something in and not worrying that my house will burn down. As the warmer months start rolling in I will still use my oven since I don’t mind the heat. Here’s a stuffed Cornish hen dish that’s always a hit. The stuffing is a mixture of sweet & hot sausage with seasoned bread crumbs. The little hens are rubbed down in a curry heavy seasoning with garlic and Spanish onions sprinkled on top. In the racked pan I add carrots and chunks of green pepper along with more onion and two cups of water. No oil necessary since the cooking hens seasoned fat will drip into the water creating a very flavorful sauce. I do start off with a nice aluminum foil tent over the hens so they don’t dry out while quickly browning. I usually wait for the last twenty minutes and take the foil off allowing the hens to brown to perfection. I do spoon the sauce created in the bottom over them after removing the foil. In the end, you’ll have a easy tasty dish that’s as easy to make as well as clean up. I did make a tossed salad to offset the meaty dish but it goes well with rice or noddles! I usually do my experimental cooking and meal planning during the weekend. A couple of weeks ago, a good friend asked if I knew any good mustard sauce recipes and of course I did. She wanted it but didn’t want to make it herself so I made her a large jar of my dark flavored layered sauce which she bows put on everything. This sauce calls for cumin, ground mustard powder, salt, sugar, pepper, paprika and curry along with a bit of olive oil, water and cayenne pepper. In a bowl I add all the dry ingredients with some water. Then in a small sauce pan add the olive oil, turn the heat low and slowly add the mixture turning frequently to prevent lumps and burning the sauce. When all the seasoned water mixture is in, take a taste to see if you need to add any of the dry seasonings ntil you get the flavoring that you like. Sometimes in the mixing process I will add a bit of vingear and hot sauce along with jam or honey depending on my mood. Enjoy. A good friend of mine had a large roasted pig at his birthday party that was stuffed with all pork meat products! Spicy sausages, pulled pork, links, you name it – it was in there. It was so tasty that I figured it should taste just great on a smaller scale. 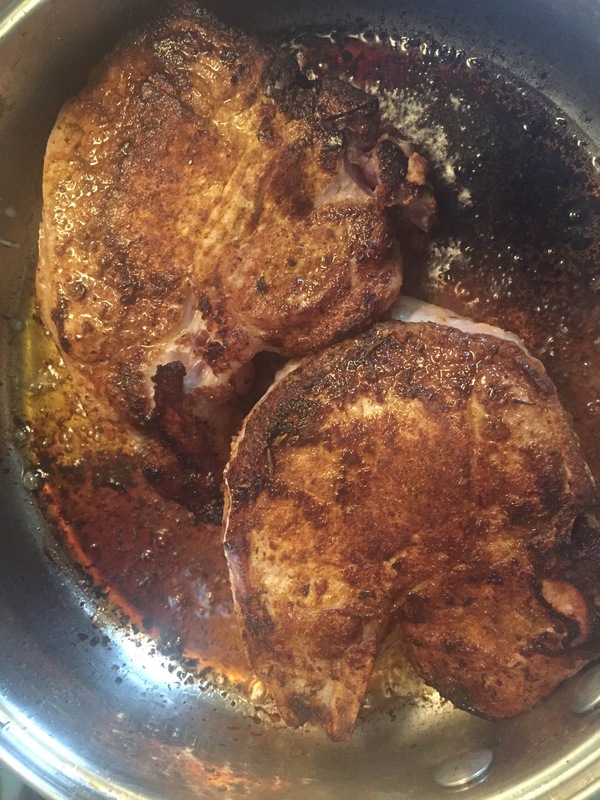 I love bone in pork chops because I do enjoy sucking on the bone to get to that baked in or fried flavors and seasoning. These were nicely butterfly, seasoned and stuffed with the bacon before being wrapped in bacon. No oil was used since the bacon and the pork chop fat were all the oil needed. When I make pork chops I have a habit of putting it with red beans rice but figured I would do a twist on a risotto. Balsamic creamy risotto had just the right amount of smoothness and bite to go with the pork chop. Add in some corn and slices of avocado and you have a colorful, delicious plate of food. Experiment with different types of bacon as well as seasoning combinations to make this wonderful combination your own. There’s nothing my dad use to love more than a good piece of nicely cooked steak. Even when he got older and should have avoided the steak he would still gum it down. So when I cooked his steak it was always full of flavor. I would change up the seasoning and cooking style just to surprise him. I did this recipe in his honor. Pot Roast Steak is cooking the steak as though it’s a pot roast. You’ll need two 3/4 inch steaks, eight pieces of pepper bacon, nine small red skin potatoes, three handful of baby carrots, half small Spanish onion, half green pepper and five garlic cloves. Seasoning consists of salt (just three pinches), pepper, paprika and ground cumin. Combine the dry ingredients in a small container so you can season the steaks completely. In an oven pan (regular or foil) place at least five pieces of pepper bacon. Then directly on top place the slice in half red potatoes and baby carrots. Cover the vegetables with the seasoned steak then place the three remains steaks on top with one on each side and one down the center. Then place the sliced separated onion pieces sprinkled on top and to the side along with the chopped green pepper and the finely chopped garlic cloves. Tent with aluminum foil and place in a 450-degree oven for about an hour and 20 minutes. The bacon and covered steak will provide the steak dressing and the veggies will have that delicious pepper bacon flavoring. Of course, you will want to eat the bacon as well. The fun part of this dish is you don’t have to use any oil and it’s really hard to mess up. I got my steak and peppered bacon from Cheplic’s a family of local butchers. All of their meat is home grown and trust me, you can tell the difference when you chow down. Here’s Cheplic’s website: http://www.cheplic.com and they did not ask me for any endorsement and I purchased my meat. Now, you may be wondering what an island girl like me would know about a great cut of meat. Well. My family would get fresh meat during the holiday season so that would mean butchering a cow, pig or goat. The freezer would be stacked for days with tasty meat. No dyes, forced feed, tough meat for us and when we had to go back to supermarket meats at times. The difference was easy enough to taste and see. So give the local butchers a chance and let your taste bud direct you.